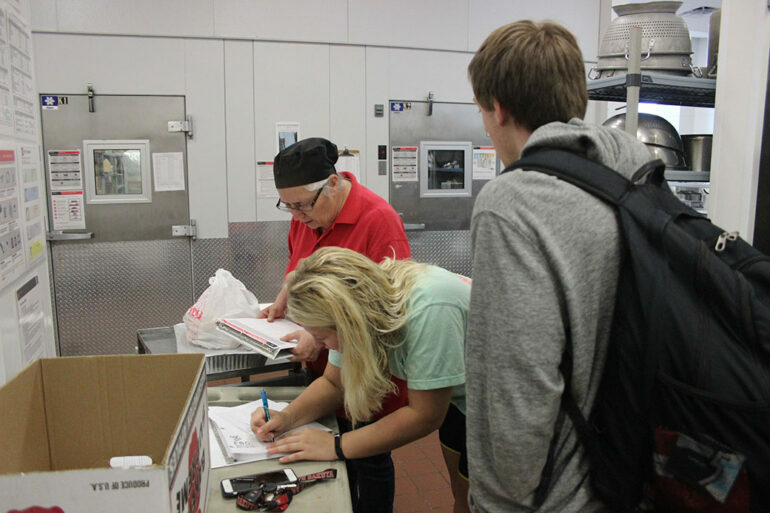 The small, 15-pound box of assorted food being donated to the Vermillion Welcome Table on Friday wasn’t much of a sight to see, but for a few USD students, it was the culmination of more than a year of work. A newly implemented Food Recovery Program at USD aims to take food that would otherwise be thrown out at the MUC and donate it to help solve food insecurity in Clay County. The program is part of the larger Food Recovery Network, a student movement which seeks to end food insecurity in the United States with more than 191 chapters at schools across the nation donating food to people in need via local nonprofit organizations. The groundwork for USD’s chapter was laid by Eric Schlimgen, a recently graduated law student who was also working on his master’s degree in public administration. For his capstone project in public administration, he decided to tackle food insecurity, Koch said. “As part of his capstone he wanted the Food Recovery Network thing to happen here because Vermillion does really struggle with food insecurity and food waste so the Food Recovery Network is a way to really combat both of those things at the same time,” he said. Schlimgen, now a law clerk for the Fourth Judicial Circuit in Deadwood, South Dakota, said he’s happy that the program is being implemented and hopes it lasts for years to come. According to Feeding South Dakota, a nonprofit organization that seeks to end hunger in South Dakota, more than 12 percent of South Dakota’s population has been food insecure in recent years. “I know like even (Einstein Bros. Bagels) their bagels expire every four hours so if you can imagine how many people like during like a slow day or something — that’s a lot of bagels,” said Hailey Purves, an AWOL member and the director of the Food Recovery Network at USD who took over the project when Schlimgen graduated in the spring. Lushbough said USD isn’t the only place that’s donating food on a weekly basis. Walmart and Hy-Vee also donate their leftover food to be used. “I think we’ve really seen a huge difference in Vermillion just in the last couple of years with the amount food that’s been recovered, not just with this program — it’s just a sort of continuation of things,” he said. Purves said students at USD should care about the food insecurity issue in the community and do what they can to help solve it. For the first day of the program only Purves and John Fanta, the president of SERVE, were the ones to collect the food, but Purves said they hope the number of students who take part in the program will grow as more people become aware about it.